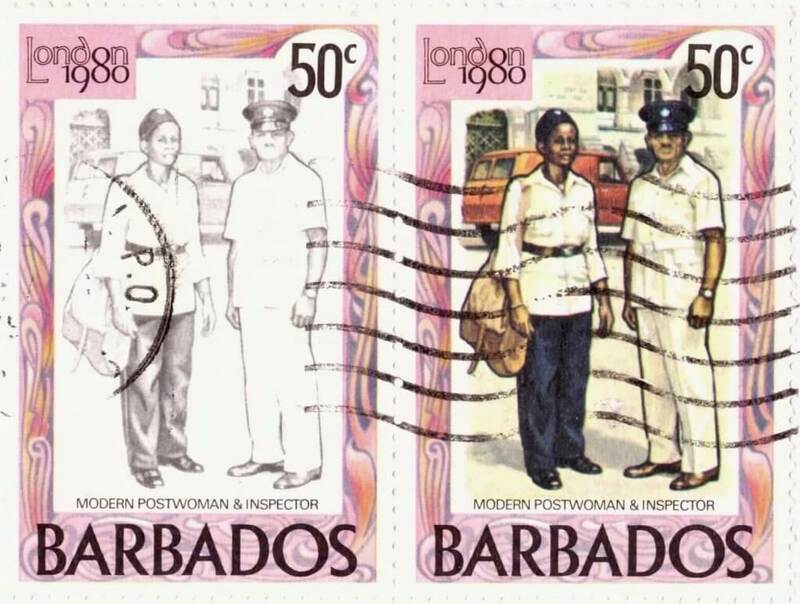 Home / Barbados Stamps / My stamp has some colour missing so is it rare or unusual? This is a question that gets asked more often than you might think. A simple online search will show that lots of people find stamps with colours missing and heartened by the prices they see against some of them on Dealer’s websites, they start to think that they have stumbled upon something valuable. So, let’s start by saying that in the main, most stamps that are discovered with one or more colours missing are generally worthless. I know this might sound harsh but it’s a fact of life I’m afraid. How do stamp colours get omitted? To understand this we need to understand how colours come to be missing. Typically, there are just two ways a stamp can be without a colour; either it was never there in the first place or it was there, but has somehow been removed. One of the most famous stamp forgers ever Jean Sperati, was famous for being able to remove the colour on early Australian stamps and reinsert a new colour and value tablet turning a cheap stamp into a copy of the highest value and rarest stamp in a set. So, it can be done but you will need a detailed knowledge of printing techniques and chemistry to make your own forgeries! The stamps that turn out to be valuable almost always are missing a colour as part of the printing process. As the stamp has passed through the printing process one or more of the colours has been omitted and it has not been noticed during the quality checks at the end. Often, this is found on GB stamps from the 1970’s where production issues and a general lack of quality control meant a variety of different errors were released on the market. Many of these errors are now detailed and can be found priced in a number of publications as well as in various online reference areas. How can I tell if a colour is faded or omitted? This is a good question and in some cases, it can be hard. The starting point is to understand if the exact stamp you have is shown anywhere else online in the same state. Is there a verified copy out there with exactly the same issue as your stamp? As you can see, the legs are completely absent and the condition of the stamp tells you that these stamps have been well looked after. This pair of stamps realised £110 at auction and as a genuine and recognised error, this is probably a fair price. But for every genuine error of colour, there are literally hundreds of faded stamps which people often hope are the real deal. So, your second check is to see which colours are missing. If it’s red and or yellow then the chances are that it’s a colour fade, as these are typically the first colours to go. Test this yourself by taking two stamps, leaving one in a drawer and the other on your window sill and after a week, compare the two. It will soon become clear which colours fade first. There are some stamps however which are a little harder to say with certainty whether they are a colour fade or colour omitted. Here’s a really good example sent in recently by a reader of this website. A pair of Barbados stamps- colour omitted or colour faded? As you can see, the stamp in question is a full colour stamp on the right hand side of the pair and on the left is, what appears to be a colour missing or faded version. At first, my reaction was that it appeared to be a sun faded copy of the stamp, attached to a non faded copy. 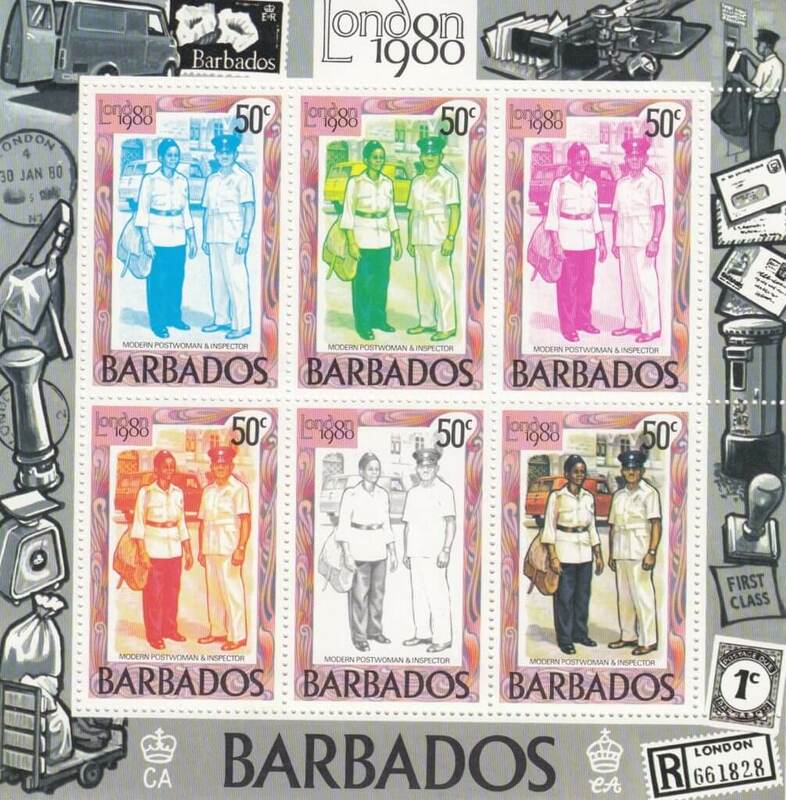 The stamps on this issue were printed in two separate phases, the external frame (London 1980 in pink) and then a second run through of the printing to insert the vignette, or centre part. The centre images were printed using a different printing method and the inks are prone to fading so if you were to leave it in the sun near a window, in a week or so it would be bleached of all colour. My thought was that if this pair of stamps had been left, one inside a book and one outside in the sun, this could give the resulting look and feel. Something, however, didn’t feel right and despite arriving at this conclusion I did keep digging and just as well. What didn’t feel right was that the cancel didn’t appear to be half faded. This meant that the stamps had to have been faded before they were used and given the intensity of the sun in Barbados that’s quite possible. But still it didn’t feel right and that’s when it hit me; the stamps are from a mini sheet. And of course, if they are from a mini sheet then it would be a lot harder to fade just one stamp. So does this mean it’s a genuine colour error? The sheet was designed specifically to highlight the printing process being used to create the stamps and in this case, it was the layering of five colours to make a final, sixth, full colour stamp. Theoretically then, five of the stamps do have ‘colour omitted’ but in this instance it’s deliberate. And because of this, I’m afraid the catalogue value is pennies, not pounds. Part of the reason for writing this article is that we regularly receive emails from readers asking if their stamps are valuable and in most cases, the answer is ‘no’. Hopefully, this gives you an idea on how to start checking whether the colour is faded or omitted. And if you do have a stamp which you think is valuable then please send me a high-resolution scan so I can feature it on the website? But please don’t be too disheartened if I write back and tell you it’s not rare, they rarely are!